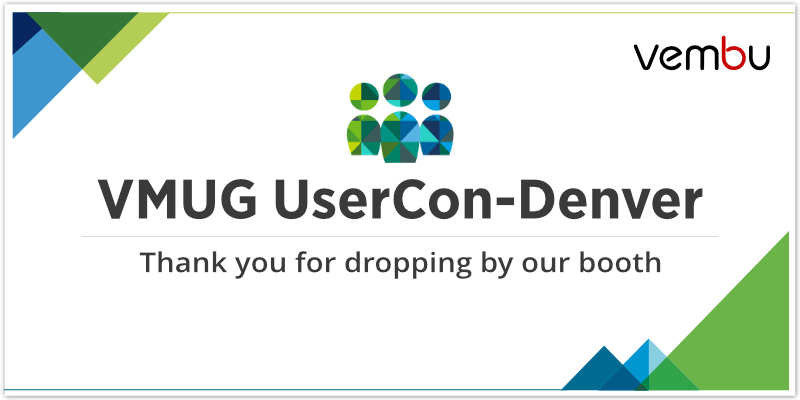 We are overwhelmed with the response from the attendees of VMUG which was conducted in Denver on 9th April 2019. VMUG UserCon event is an excellent platform for IT admins and techies to know the latest developments and insights in the market. This conference is exclusive for the VMware users and they help them gain a broader perspective about the solutions available. During our participation in this UserCon, the main thing which our experts observed is that users have become more aware of the importance of data protection and business continuity. They are looking forward to exploring solutions which are comprehensive and can adapt to the ever-changing market trends and requirements. If you had visited our booth, you would now know that Vembu is one such provider. Vembu’s flagship product – Vembu BDR Suite, is a comprehensive Backup & DR solution. Those who dropped by Vembu’s booth were pleased to know that Vembu is an all-inclusive data protection solution designed to protect diverse IT environment including physical, virtual and cloud. Vembu offers enterprise-level data protection features to avail business continuity at affordable pricing! We are happy to have received such great response from the attendees and thankful to all those who made the event a great success for us. Also, if you weren’t able to meet us at this conference, you can meet us soon at Vembu Roadshow, Denver. Marketing Analyst. A bookworm who believes in the words "Energy and persistence conquer all things."